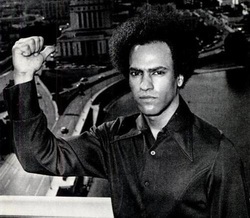 Born Huey Percy Newton on February 17, 1942, in Monroe, Louisiana, Newton helped establish the controversial African American political organization, The Black Panther Party, and became a leading figure in the black power movement of the 1960s. As a teenager growing up in Oakland, California, he got in trouble with the law - as he spent numerous years in prison throughout his life. Despite his predicaments with the law, Newton began to take his education seriously. Although Newton barely knew how to read, he graduated high school in 1959. After graduating, he began to teach himself how to read. During the 1960s Newton decided to pursue his education at Merritt College where he met Bobby Seale. Newton and Seale were already involved and interested in political groups and associations before creating their own. Founded in 1966, they called their group The Black Panther Party for Self Defense. Many groups that looked for social advancements shied away from violence, but not the panthers. Their group was notoriously known for taking a militant stance, and often seen brandishing weapons. A famous photograph shows Newton holding a gun in one hand and a spear in the other. The group believed that violence, or the threat of violence, might be needed to bring about social change for their race. They set forth their political goals in a document called the Ten-Point Program, which included better housing, jobs, and education for African Americans. It also called for an end to economic exploitation of black communities. Still the organization itself was not afraid to punctuate its message with a show of force. For example, to protest a gun bill in 1967, Newton and other members of the Panthers entered the California Legislature fully armed. And Newton emerged as a leading figure in the black militant movement. The sensational life of Huey P. Newton tragically ended on August 22, 1989. He was found on an Oakland street lying in blood. The irony of Newton’s death was that he was shot in the same neighborhood where Black Panther members would work with area churches to serve free breakfast to young people. Newton left behind a legacy that put the power in the hands of the people. As Newton described it, “Black Power is giving power to people who have not had power to determine their destiny.” He did not die without meaning, as Newton accomplished exactly what he had set out to do.